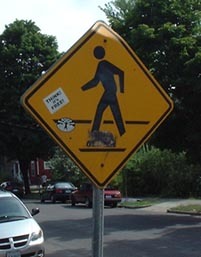 8/04/2002 - We've all seen these signs...y'know, the ones with the guy crossing the street. 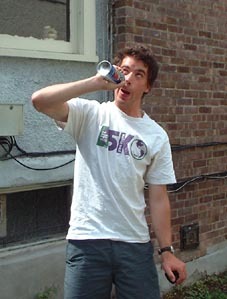 One day when Ton was hanging out at a friend's house he saw a perfect opportunity for a prank! 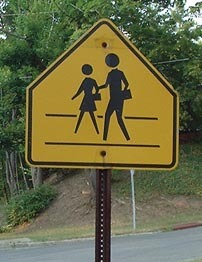 On the corner there was a crosswalk with two crosswalk signs. 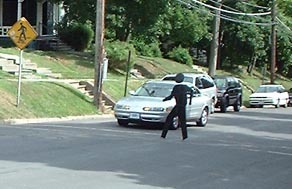 Wouldn't it be nuts if you were driving along and there actually was a guy shaped like that crossing the street? He did. 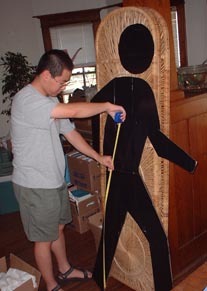 Inspired, we rushed home and started construction of a life-size replica of the man in the sign. 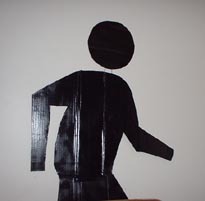 We cut a silhouette of Crossing Man out of flattened cardboard boxes. Fortunately there were a lot of boxes around because of our recent mjove. 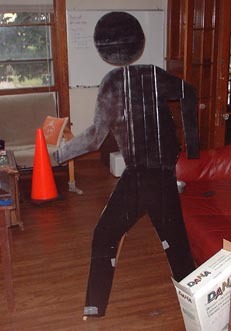 But we didn't have a piece of cardboard big enough for the entire body, so we split Crossing Man into three sections: the legs, the torso, and the head. Two copies of the legs were made and the torso was sandwiched between them for extra strength. The head was attached to the torso using coat hangers (is there anything they can't do?). 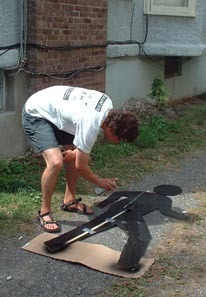 Finally, we spray painted Crossing Man with semi-gloss black paint #1974. But alas, Crossing Man always flopped over when he tried to stand by himself, so after a heated debate between Justin and Ton, we decided on using pieces of wood to create a tripod stand. We headed down to the local 84 (or was it 69 or 66, no it was 84) for some lumber. 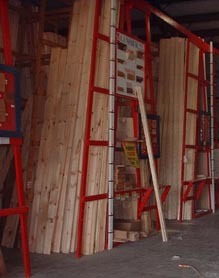 We perused the stacks of lumber (they have 20 foot long pieces of wood molding!) and picked out some 1/2 inch thick pieces wood. 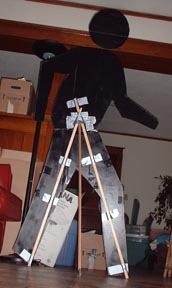 A strip of wood was attached to each leg and fastened with duct tape. 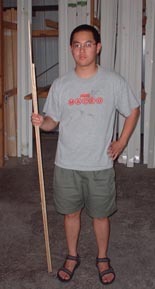 The final piece of wood was wedged between the two to form a sturdy tripod. Justin spray painted the legs again so that wood was hidden. He did so much spray painting that he had to go to the hospital for inhaling fumes. Now Crossing Man was finished and it was time to put him in the street. But wait! He was to big to fit in Ton's car! What to do? Strap him to the roof of the car? Take the bus? 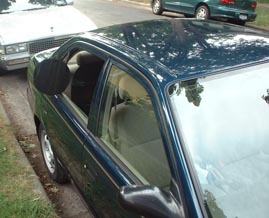 Fortunately, Ton's car had windows, so we rolled down the windows in the car and layed him across the back seat and then drove to the site. Anyway, we drove to the intersection and surrepticiously set up Crossing Man. Here he is crossing the street! Several cars slowed down to get a better look. (There was much debate about the legality of placing objects in the middle of the road). We wanted to take a picture of Crossing Man from a moving car. 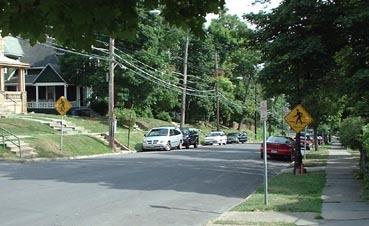 So we hopped back in the car and drove around the block to make a drive by of the crosswalk. 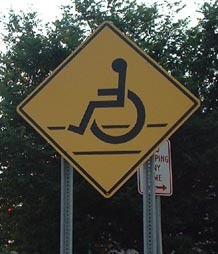 But when we got back to the crosswalk Crossing Man was gone! We literally drove around the block and were gone for less than a minute! He just up and...well...theory has it that he walked off. 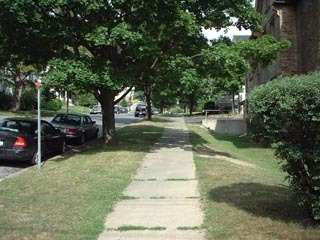 This is the sidewalk we think he took. Perhaps he was late for a lunch date with his wife and daughter...or his grandfather. Oh well, it would have been nice to have him around for a few hours, but I guess he was in a hurry. Let us know if you see him! 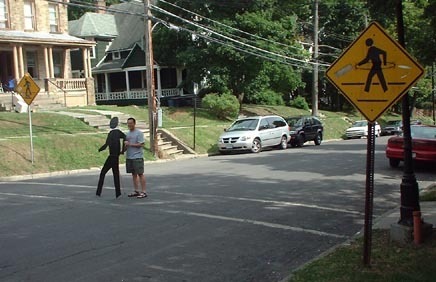 8-05-2002 - It's been 24 hours and still no sign of Crossing Man (ha ha, pun intended). 8-06-2002 - It's been 48 hours and still no sign of Crossing Man. *New* Crossing Man sightings around the world!